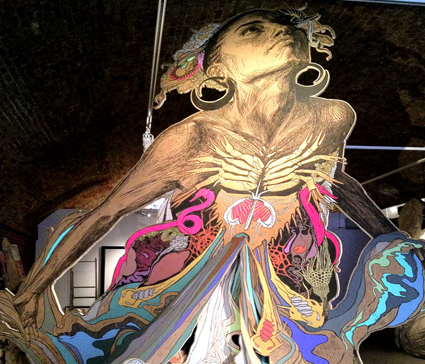 Creator Project Video Screenings features international urban street artists: David Choe-USA; Swoon-USA; Os Gemeos-Brazil. Educational video screenings, interviews and artworks of three major artists, with juxtaposed methodologies that push the limits of art, culture and interaction. The screenings broach the issue of street art transcended by artistic genius. It highlights the special relationship of creative people, those “technical poets” who, rather than restricting themselves to the utilitarian aspect, base their research on an understanding of existence and the beauty of urban art. Gallery 3. Don’t miss the Gala Opening Reception Birthday/Appreciation Party! A night of special Appreciation for artists, volunteers, performers and partners of Defsup. Featuring a ferocity of art/musical performances and a bevy of catered summer refreshments with exquisite retro birthday CAKES and two other coinciding shows.